Quick guide to student finance if you’re from Scotland - Which? Note, the below refers to Scottish students studying in Scotland for the 2019/20 academic year (unless otherwise stated). While there are some basic residence criteria to satisfy, Scottish students can generally breathe a sigh of relief when it comes to stumping up for tuition fees. However, iIf you’re a Scottish student planning to study further afield in England, Northern Ireland or Wales, you could be looking at up to £9,250 a year in tuition fees. However, there are loans and grants available to cover these upfront, which you can repay later. Don't forget about your living costs, either! 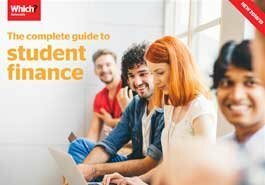 See our guides on student finance in England, Northern Ireland and Wales. The Student Awards Agency Scotland (SAAS) gives financial support for Scottish students pursuing higher education anywhere in the UK, so it’s a good idea to familiarise yourself with this agency. The main conclusion is that there are two main types of student in Scotland. The following information in this guide is aimed at what the SAAS refer to as young students. you are not married, in a civil partnership or living with a partner before the first day of the first academic year of your course – this will be reviewed if your circumstances change during your course. If you don’t meet all of these requirements, you will probably fall under the status of an independent student, and the information below might not quite apply. The SAAS has more information for independent student funding. Whether you're a young student or an independent student, if you stay in Scotland to go to uni, then good news: your tuition fees will be paid for you by the SAAS – you don’t have to pay back a thing! In 2018/19, 128,176 Scottish students had their fees covered. study full-time in Higher Education. Usually you'll be covered for the duration of your degree course, plus one extra year should you need it (eg you take a year out and then return to your course). Remember though that you still need to apply to the SAAS for this, each year of your course. Don’t automatically assume you’ll get it without sending in your application or because you submitted it the previous year already. We would suggest applying for student finance by the end of March, based on previous years' timeframes. You can apply afterwards (up to nine months after the start of your course), but it's best to apply by this time to ensure you receive this by the time your course begins. Is there student finance for living costs? So you don’t have to worry about tuition fees – fantastic! But you still need to think about money for accommodation, books, travel and nights out. You can apply for a Maintenance Loan which is means-tested based on your household and circumstances. The maximum you can receive is £5,750 and the minimum is £4,750. This must be repaid. There’s more information about the maintenance support available for Scottish students on the SAAS website. The loans and bursaries we talk about above shouldn't interfere with any extra funding you may apply for, namely bursaries or scholarships to help with tuition fees or living costs (partially or in full). These can be offered by your university, as well as companies, organisations or charities, for a number of reasons. Plus, they don't have to be repaid! What extra funding is available? There are also further funding options for specific courses, such as student nurse bursaries if you're studying nursing and midwifery. The SAAS website has more details around eligibility criteria and how to apply. Extra help is available if you incur additional costs while you study because of a disability or learning difficulty. If this is the first time you’re applying for the allowance, or if you’ve applied before but your disability has changed significantly since you last applied, a needs assessment will have to be carried out. The SAAS website has a PDF for those looking for more information on the Disabled Students' Allowance. Have an adult dependant or are you a lone parent? There are also living cost grants for those caring for an adult dependant, or those who are a lone parent. You won't need to pay either of these back, so it's worth doing some research if this applies to you. Note, there are some eligibility conditions to meet in order to qualify for these and they are income-assessed. How do student loan repayments work in Scotland? If you’re a Scottish student, you won’t begin repaying any student loans (nor interest on top) until the April after you graduate and only once you’re earning more than £18,935 per year (according to Plan 1 student loans). Note, this repayment threshold has gone up from £18,330 as of 6 April 2019. You’ll repay 9% of whatever you earn annually above this amount. This threshold will usually go up incrementally each year in line with inflation, so keep checking back to see what it is when you begin repaying. Repayments will be taken from your pay by your employer, alongside tax and National Insurance. If your annual salary drops below this threshold at any point, your repayments will cease until you're earning above this again. The government subsidises the actual cost of interest on the loans so any interest that accumulates will also be linked to the rate of inflation. Simply put, the amount you put back will be roughly the same compared with what you originally borrowed. Interest accumulates at either Bank of England's base rate + 1% or the UK Retail Price Index (RPI), whichever is lowest. Keep up-to-date with Plan 1 interest rates on the Student Loans Company website. After 35 years, any outstanding debt you still owe will be written off, even if you didn’t pay anything during that time. Read more about Scottish loan repayments on the SAAS site.